M. de la Motte, "Cy Twombly," Kunstforum International, no. 4/5, 1973, p. 121 (illustrated). H. Bastian, ed., Cy Twombly, Catalogue Raisonn of the Paintings, Munich, 1992, vol. I (1948-1960), p. 114, no. 59 (illustrated in color, p. 115). New York, Stable Gallery, Cy Twombly, January 1956. 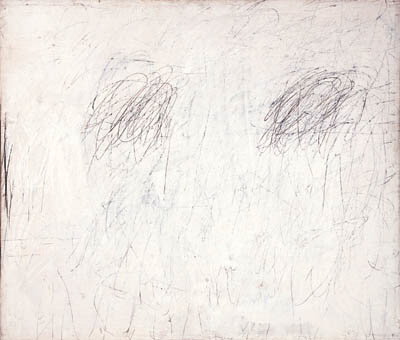 Bern, Kunsthalle, and Munich, Stdtische Galerie im Lenbachhaus, Cy Twombly: Bilder 1953-1972, April-August 1973, no. 3 (illustrated). Though seemingly contradictory, these pictures are the most impersonal archetypical manifestations while simultaneoulsy sustained by the most personal intellectual and spiritual avowals. These works... must be counted among the artist's early key works, because they so uncompromisingly preserve the animism of the sign; they do not 'deform' it pictorially but validate it as a visionary metaphor of high culture. (H. Bastian, op. cit., p. 24).